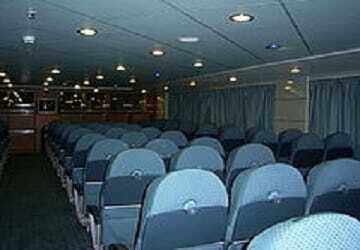 The Athara is a fast cruise ferry and has a capacity of almost 3000 passengers. It can hold up to 900 cars in its garages. Cabins are modern, well equipped and all come with their own shower, sink and toilet. 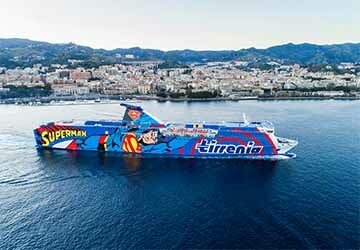 On board you will find a bar, restaurant, self-service restaurant, children’s play area and a cinema. Please Note: Whilst we have taken great care in making our Athara guide as accurate as possible, onboard facilities, services and entertainment may vary depending on the date and time of year that you travel, facilities mentioned may change without notification and ferry companies reserve the right to operate vessels other than those mentioned at time of booking without prior notification. Me and my wife really enjoyed the journey it was really fancy and thank fort that also quiet sea. Ship was clean. We found a relly competent and helpfull staff. We arrived in advance. The ticket was not too expansive. Always like that Mrs Tirrenia. Compliments and good job! We had a good experience on board of the Tirrenia ferries, despite the fact we travelled without cabin and the staff was rude when they woke up us in the morning. We were in 4 and we slept in a first class cabin. Comfortable trip both ways, I'll book it again. The only problem has been the dinner, the queue was too long for the self-service so we choose the restaurant… bad idea! low quality of food and service, too expensive. First time to use this service. Efficient and facilities on board varied. THE RECEPTION WAS PERFECT. THE FOOD WAS DISAPPOITING. NO SARDINIAN WINE ON THE MENU!!! We are happy with our crossing. The only thing is that the announcements are not made in French. "A Tirrenia Sardinia ferry crossing between Porto Torres and Genoa"
As it was low season, the journey was very good: the ship was clean, the cabin was well laid out and we disembarked on time. The only potential issue was the disorganisation at boarding (the check-in takes place at the ferry terminal, which is more than 2 kilometres away from the jetty). If someone arrives in Porto Torres and follow the signposting for boarding, they end up needing to go back to check-in and then to the jetty again. Every went well, nothing to report. "genoa porto torres a good value for money"
Nothing to report regarding the reception in Genoa and in Porto Torres. Nothing to report about the boarding and the disembarkment. The self service restaurant could be better. The waiting time to pay is too long and the dished which are barely warm become cold. One negative: the morning coffee in the self restaurant is disgusting. It's awful, especially after a week of excellent Italian coffee. Except for the coffee (which is not a major issue anyway), everything was fine. The journey was relaxed and peaceful, it's a pity that is not always like that, if the prices could be cheaper.. Sardinia could have much more tourists! "Car Ferry Genoa-Porto Torres "
The boat tour was on the whole in order. On the negative side acoustically unintelligible loudspeaker announcements. The food in the buffet restaurant was lukewarm, the choice of breakfast on the return trip meager. Places to stay in the bar area were severely limited by passengers who occupied their sleeping places there. "Porto Torres to Genoa September 2013"
Directferries' confirmation email stated that the tickets could be collected at the warf. When got there we were sent back because we had to collect them from Stazione Maritima, roughly 1km in the direction of the city. Queued up there again. Unbelievable that Directferries provides incorrect information!! the journey itself was satisfactory, but we did think that too many passengers claimed public space to sleep (even double air matrasses). Its been a really long since I took the Tirrenia ferry, but I think that after this experience, I will not take it anymore. No problem, we were very satisfied! Departure and arrival on time, decent cabin. A charming journey in a cabin. We had meals at the self restaurant. Good value. We appreciated the kindness of the staff. If we ever go back to Sardinia, we'll use the same company.